Large Format means big. Bigger film allows you to project a bigger sharper image on a bigger screen - so your movie going experience is bigger. In fact, the Large Format image is ten times the size of the normal feature film image (shot on 35mm film). And a good three times bigger than those "special" features shot on 70mm. And fyi, student films and documentaries are usually shot on 16mm. And before videotape, mom and pops used to buy 3-minute reels of 8mm. Get the picture? Often found at museums and amusement parks, Large Format screens are becoming popular additions to regular feature film theaters. 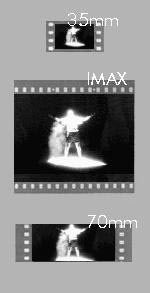 Though the term IMAX is nearly synonymous with Large Format, it is but one manufacturer - two others are iWerks and Mega. Shot on film that is 70mm wide while allowing each frame a length of 15 sprocket holes, Large Format is often simply referred to as 15/70. Even though Large Format is actually 70mm, it runs though the camera sideways to extend the height of the image ... see the graphic. Pretty cool huh? Anyway, if you thought 35mm film was expensive to shoot on and then duplicate for distribution ... you should try buying a reel of Large Format Film. For this reason, and because the human being can take only so much sensory input ... Large Format Films are usually quite a bit shorter in length than a standard feature: 30 to 50 minutes. And because large format flicks still aren't frequented like the blockbuster hits on 35, most of the titles available are educational in some way, funded by private firms or government agencies interested in making the public smarter about a particular topic. But don't assume that means you'll be snoozin' - large format filmmakers are getting better and better at impressing our eyes and minds at the same time. Personally, I love 'em! Large Format Cinema Association. 2001 Annual Conference.